The Russian undesirable organizations law (officially Federal Law of 23.05.2015 N 129-FZ "On amendments of some legislative acts of the Russian Federation"; Федеральный закон от 23.05.2015 № 129-ФЗ "О внесении изменений в отдельные законодательные акты Российской Федерации") is a law that was signed by President Vladimir Putin on 23 May 2015 as a follow-up to the 2012 Russian foreign agent law. The law gives prosecutors the power to extrajudicially declare foreign and international organizations "undesirable" in Russia and shut them down. Organizations that do not disband when given notice to do so, as well as Russians who maintain ties to them, are subject to high fines and significant jail time. Critics say the terms are unclear and lead to dangerous precedent. Supporters of the bill reference organizations that have become actively involved in supporting political dissent. 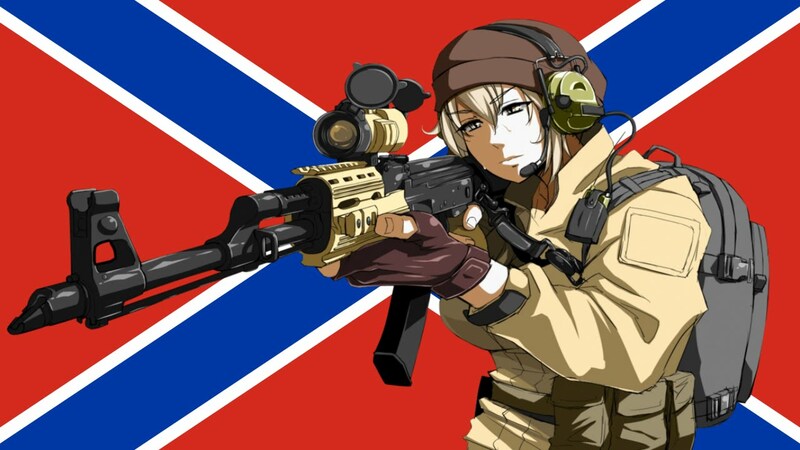 Under the law, Russian prosecutors are able to target foreign groups which they deem to present "a threat to the foundation of the constitutional order of the Russian Federation, the defense capability of the country or the security of the state." Groups designated undesirable are forbidden from holding public events and from possessing or distributing promotional materials, including via mass media. All Russian banks and financial institutions are forbidden from cooperating with such organizations and are required to inform Russia's financial watchdog agency about any such organizations that attempt to contact them. Given a notice from the prosecutors, such organizations have to disband. Violators face fines or prison terms of up to six years. People cooperating with such entities are subject to fines and can be banned from entering Russia. Russians who maintain ties with "undesirables" face penalties ranging from fines to a maximum of six years in prison. 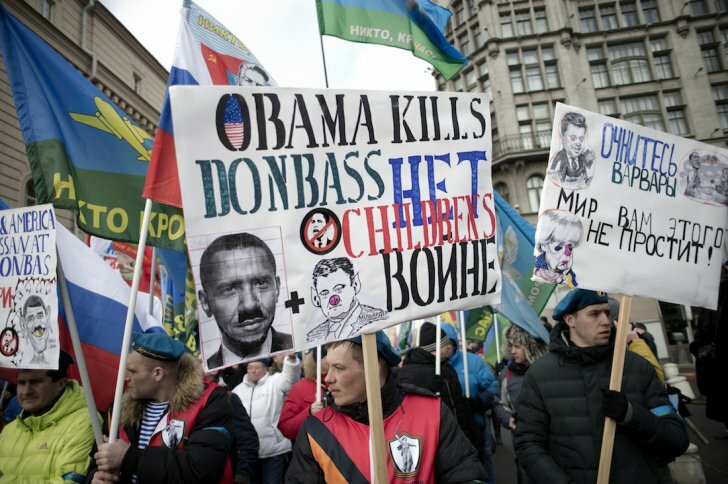 Protestors hold up a sign that shows U.S. President Barack Obama wearing an Adolf Hitler-style mustache. 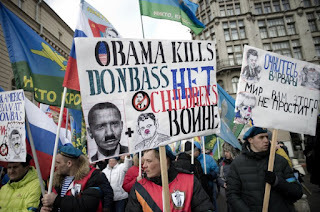 The sign reads: "Obama Kills Donbass Childrens [sic]" alongside the Russian words "No to War." The sign on the right reads: "Wake up, barbarians. The world will not forgive you for this." 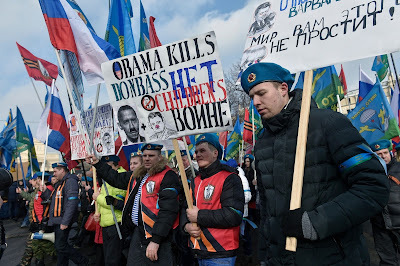 It is accompanied by images of Ukrainian President Petro Poroshenko, German Chancellor Angela Merkel and Obama. Duma deputy Aleksandr Tarnavsky, one of the legislation's coauthors, stated that "I do not think that there is a particular company that has to fall under this list. But if a company suddenly starts causing a lot of trouble, starts acting arrogantly and impudently, then in theory it could fall under the list of undesirable organizations." On 25 May 2015, a first proposal of undesirable NGOs to the General Prosecutor's office was made by a parliamentarian from LDPR. The list included the think tank Carnegie Moscow Center, the international history and human rights society Memorial, as well as the Moscow offices of Human Rights Watch and Amnesty International. On 7 July 2015, RIA Novosti published an alleged shortlist by the Federal Council of Russia of organizations to be branded undesirable. Those include the US-based Open Society Institute, the National Endowment for Democracy, the MacArthur Foundation and the Charles Stewart Mott Foundation. The list also includes the Polish-based Education for Democracy foundation and the East European Democratic Centre as well as three Ukrainian organizations: The Ukrainian World Congress, the Ukrainian World Coordinating Council and the Crimean Field Mission on Human Rights. After the Federal Council's vote to include it on the recommended list of "undesirable organizations", the MacArthur Foundation announced the closing of its Russian division, operating since 1992. In July 2015, the National Endowment for Democracy became the first organization to be officially blacklisted by the Russian authorities under the law. The decision by the Office of the Prosecutor General of the Russian Federation was announced on its website in which it claimed that NED's activities "pose a threat to constitutional order of the Russian Federation, defense potential and security of the state". Among NED's alleged infractions were its donations to commercial and non-profit organizations that independently monitor elections, as well as for undefined "political activities" and "discrediting service in the [Russian] armed forces". 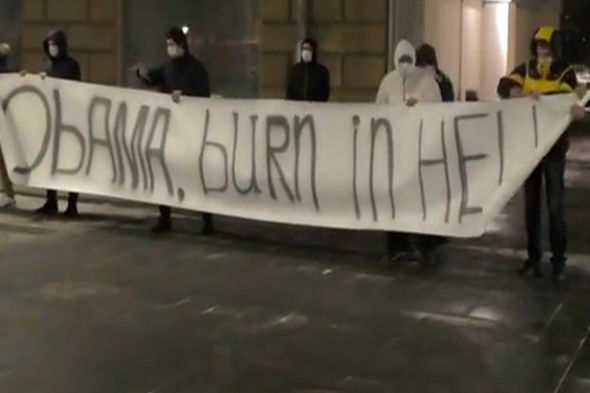 In November 2015, two branches of George Soros' charity network, the Open Society Foundations and the Open Society Institute Assistance Foundation, were banned under the law in Russia. The infractions were not listed, but the Office of the Prosecutor General of the Russian Federation released a statement stating that "the activity of the Open Society Foundations and the Open Society Institute Assistance Foundation represents a threat to the foundations of the constitutional system of the Russian Federation and the security of the state". National Democratic Institute for International Affairs (May 17, 2016). Media Development Investment Fund (16 August 2016). 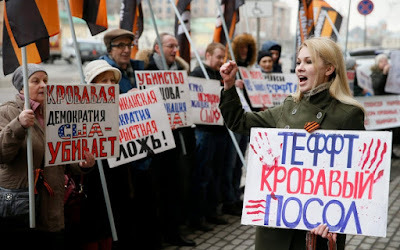 Russia's human rights ombudsman Ella Pamfilova said the power given to the Prosecutor General to tag groups "undesirable" without going to court contradicts the Russian constitution and condemned the lack of a right to appeal. German Chancellor Angela Merkel's spokesman said that the law was an attempt to further isolate and discredit members of civil society who were critical of the government. Britain's Minister for Europe, David Lidington, said it was "yet another example of the Russian authorities' harassment of NGOs and those who work with them in Russia". The US state department stated it was "deeply troubled" by the law and expressed concern that it "will further restrict the work of civil society in Russia and is a further example of the Russian government's growing crackdown on independent voices and intentional steps to isolate the Russian people from the world". The Deputy Chief of the US Mission to the OSCE Permanent Council urged the Russian government "to uphold its international obligations and OSCE commitments to respect the freedoms of expression, peaceful assembly and association, and the rule of law." Amnesty International said the bill would "squeeze the life" from civil society, while Human Rights Watch warned it would be locals who would be worst-hit. 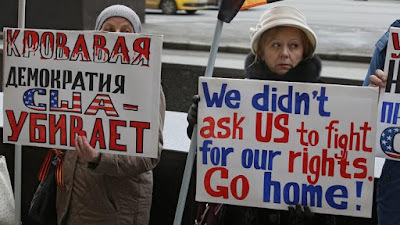 Veteran human rights activist Lyudmila Alexeyeva described the law as "another step toward lowering the curtain between our country and the West." The Russian president has signed a bill banning the activities of foreign groups that pose a threat to national security or defense capability, and to punish those who continue to cooperate with such groups. Once the group is recognized as undesirable, all its assets in Russia must be frozen, its offices closed and distribution of any of its information materials must be banned. If the group does not comply with the ban, its leaders and members would face punishments ranging from administrative fines to prison sentences of up to six years for repeated and aggravated offenses. Russian citizens and organizations that continue to work with banned groups would face administrative fines only. 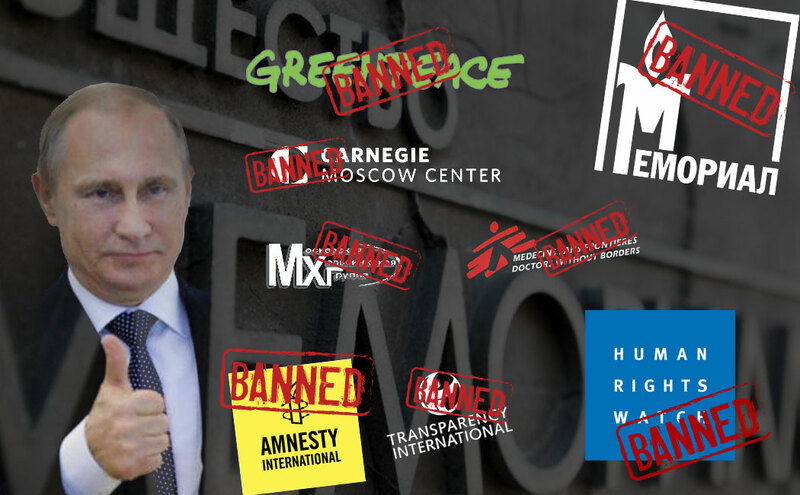 The new law faced criticism from foreign NGOs and the Russian rights community when it was first drafted. The chairman of the Presidential Council for Human Rights, Mikhail Fedotov, described the new law as “exotic,” and said that many foreign groups were “shocked” by it. Another member of the council, lawyer Aleksandr Brod, said in comments to the media that the new law was redundant, as there were enough ways in existing legislation to ensure national security and prevent foreign interference with Russian domestic politics. The European Union and the United States have officially expressed their concern over the new Russian law. 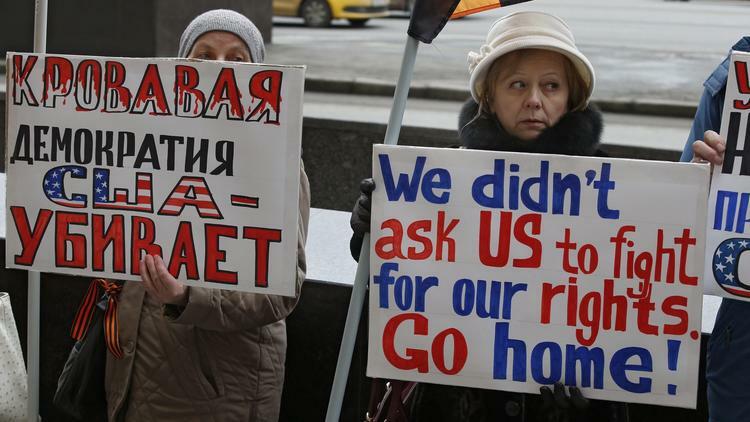 The US State Department said in a statement that the move banning cooperation with various foreign groups could bring about the isolation of the Russian people from the outside world. Russian officials have not yet reacted to these accusations. Previously, the sponsors of the bill, however, have described it as a preventive measure and denied that it was targeting any specific foreign organizations. The new law is in line with the “Foreign Agents Law” introduced in Russia in late 2012. That law specifies that all NGOs who receive funding from abroad, and that are even partially engaged in political activities, must register as foreign agents or risk substantial fines. Groups with “foreign agent” status are banned from sponsoring Russian political parties, but otherwise their activities are not restricted.